Regular exercise, abstinence from smoking, and a healthy diet are all no-brainers when it comes to reducing our risk of developing cancer. It may even help cure it when it does occur. 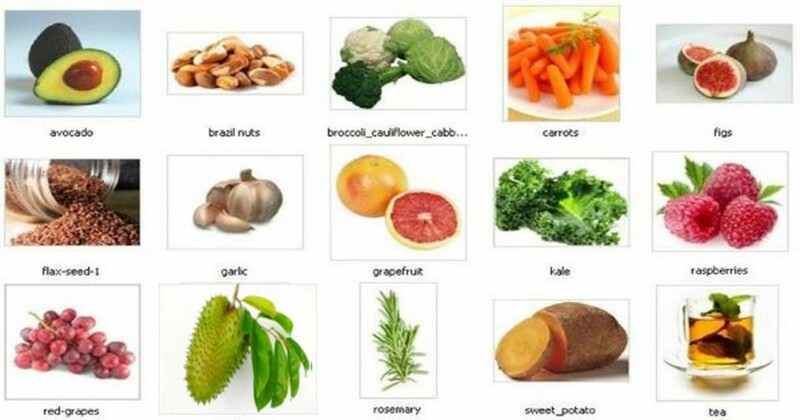 Below is a list of some of the most effective cancer fighting foods that will restore the nutrients your body needs to regain balance and promote healthy cell growth. The antioxidants in berries are primarily found in their skin and are responsible for their vibrant colors. One particular group of flavonoid antioxidants is anthocyanidins, which are found almost exclusively in berries.They enhance mental faculty and can reduce the risk of neurodegenerative diseases, like Parkinson’s (5,6). Studies have shown that anthocyanidins reduce the production of abnormal cells as well as prevent their formation in the first place. Broccoli, Brussels sprouts, cabbage, and cauliflower are all part of a group of vegetables that contain sulforaphane, a potent antioxidant. Studies have linked this phytochemical to the destruction of cancerous cells (7). Organosulfur compounds are released when garlic is cut or mashed; after being digested, they are then excreted through our skin and lungs. In fact, these compounds are responsible for “garlic breath”. When eaten raw, these compounds inhibit excess cell proliferation and kills abnormal cells (8). The resveratrol is another potent antioxidant that “…affects all three discrete stages of carcinogenesis (initiation, promotion, and progression) by modulating signal transduction pathways that control cell division and growth, apoptosis, inflammation, angiogenesis, and metastasis. The anticancer property of resveratrol has been supported by its ability to inhibit proliferation of a wide variety of human tumor cells.”(9).